I've been focused on the VWF for a couple of days and hopefully I'll have something to show you soon. The lighting effects came out great, excellent job. That's definately better. I can see the change in color pretty clearly now. A compromise between the gray background and the new background would be good I think as our prince kind of blends in too much now. Just a BIT more contrast.. because the background is almost as dark as his hair now. It is better though for sure, just perhaps a little TOO dark now (only by a tiny bit, I'm a perfectionist). And yeah, definitely like the palette changes throughout. Great work as per usual! But before doing that I wanted to ask you because I don't even know anymore - do you think that this would actually improve the game? I don't know because I'm really crazy about font stuff, but this is a text-based game after all. That's MUCH better great! And personally... 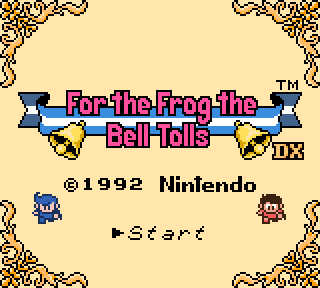 I would prefer the original Link's Awakening font. I don't really think VWF fonts are easier to read (sorry, I know you work hard on them, this is just my preference). I think Nintendo spread them out like that on purpose because of the small screen. 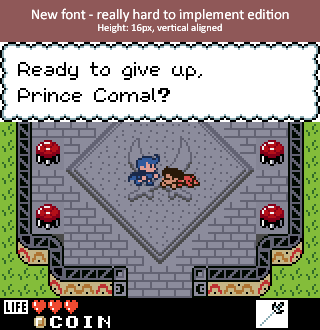 I certainly never had a problem with the font in Link's Awakening when I played it back in the day. Perhaps you should focus on the colour patch for now and release a VWF edition later for those who want it? I don't really understand games that have VWF just for the sake of having it...making the text only take up half of the width of the screen doesn't really improve anything, it just makes more dead space. Even professional translations do this sometimes. I could see if the game was being re-translated and needed the extra space, but from what I remember, it doesn't really need a new translation. I've asked a few people and they all think the same as you. It isn't very encouraging to be honest, and I also want to move on to other projects, so I'll ditch the VWF altogether. I'll just have a custom font and logo for personal use. That being said, I'll probably have one final addition before focusing on finishing the hack, and that's to increase the number of characters for the player's name from 4 to at least 6, and also remove the spaces after his name. Damn, I came late to the discussion. I personally loved the VWF rendition you made, toruzz, fits very well and looks easy on the eyes. I would encourage you to go for it as an Optional or Additional Patch to your already amazing DX hack, but that's up to you. I thought that it was obvious it worked that way, but maybe I should have used a better example. Thanks! You're literally the first one to say something nice about it. I'll just forget about the VWF for the time being, but I'm a bit headstrong so I don't completely rule out coming back to it again. If there's one thing I learned about hacking so far is that, unfortunately, you cannot please everyone. I'll only say that I really like the work you have put in this project so far, every aspect of it. To chime in, I also like your new font, and also hate Link's Awakening's approach of Italics everything. VWF is a bit redundant in my opinion, but it isn't bad. Whatever you do, this hack is still amazing. That's my conclusion anyway and I think it is a neat feature - for THAT game. The one one the right looks great and is far easier to read . What font is that? toruzz, your new font suits the game better. This is coming from an actual fine artist if it means anything. Trust your gut because you have a great grasp on color and composition. Just have to say that I've been following your hack since the beginning and it's people like you who make me want to get into making hacks and homebrews. I am very much looking forward to this release. So far, so good, dude! Thank you! I certainly enjoy making this hack and I want it to be the best it can be, but I know I have to find some balance to finish it in a reasonable time. In any case it won't be finished until I'm satisfied. It's definitely not a must, but I think it helps with really long texts. In any case it's obviously a subjective matter. Hah, that's a wild theory (a GAME theory). But I agree that LA's font doesn't fit well in this game. It's the same VWF I showed you before, I made it based on the one I made for Link's Awakening. I'm always doubting myself, so that actually means a lot coming from an artist. Thank you!